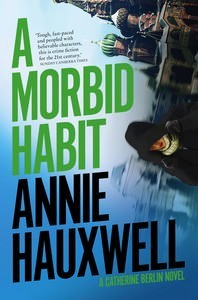 A Morbid Habit is the third novel in Annie Hauxwell’s Catherine Berlin series and to my mind, it’s her best yet. Set mostly in Russia, A Morbid Habit is as bleak and dark as a Moscow winter. The plot is satisfyingly complex, the suspense razor sharp, and the characters intriguing, if rarely likeable. A Morbid Habit opens four days before Christmas. Berlin is monitoring warehouses owned by a British company that provides ‘international security solutions’, when she witnesses unscheduled activity . The supervisor, Fagan, asks her to turn a blind eye to what he describes as ‘just a couple of casuals, like you, knocking off surplus stock to flog down the market’ to help them through the festive season. But Berlin doesn’t buy the story: the men she saw were not taking stuff out of the warehouse, they were putting stuff in. The action moves from London to Moscow, where Major Utkin of the Moscow Criminal Investigation Department, is trying to prevent ‘smoking, ball-scratching dullards’ from trampling his crime scene, an alley where a well-dressed, middle-aged Russian man has been found strangled. In the scene that follows, another Russian policeman, Yuri, is reflecting on the ‘arranged’ death of his lover Maryna’s husband, which he sees as murder and she describes as ‘liquidating an enemy’. When an old friend offers Berlin a job performing effective due diligence on a potential Russian business partner for a UK firm — an assignment that requires her to fly to Moscow on Christmas Eve — the narrative threads start to intertwine. That said, in what I am coming to see as typical of Hauxwell’s plotting style, many threads remain loose right up to the end of the book. This is in part because Berlin is not the most reliable of narrators, her judgement increasingly clouded as a result of having her buprenorphine confiscated by the Russian police within a day of her arrival in Moscow. On the subject of loose plot threads, I did find the backstory about Berlin’s Russian paternal grandfather a tad vague. But I wouldn’t put it past Hauxwell to pick this up again in subsequent instalments in the series. 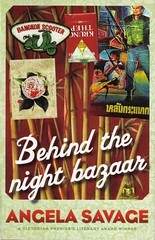 One for those who like their crime fiction on the dark side. A Morbid Habit (2014) by Annie Hauxwell is published by Penguin. Listen to my review of A Morbid Habit on Radio National Books & Arts Daily here. 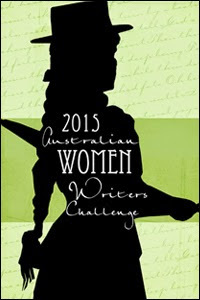 This review has been submitted as part of the Australian Women Writers Challenge for 2014. 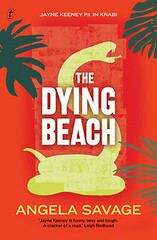 This entry was posted in Reviews & Interviews and tagged A Morbid Habit, Angela Savage, Annie Hauxwell, Australian crime fiction, Australian Women Writers, book review, Catherine Berlin series. Bookmark the permalink. 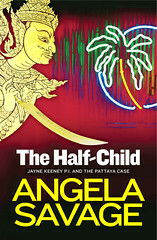 Angela – Thanks for the thoughtful and well-written review. I like Berlin’s character precisely because she is complex and flawed, but at the same time a positive force if I can put it that way. And I think that Hauxwell is effective at creating mood and atmosphere. Murky but not hopeless if that makes sense. That does make sense, Margot. A few readers of commented on how bleak this novel is, but for me it had an unexpectedly hopeful ending – which cannot be disclosed without ruining it. And I hopefully ask, will you post the radio review as you did with the first book in the series? I liked it but wasn’t thrilled with it, thought the ending had too many catastrophes and wasn’t believable. But I like the protagonist and it was interesting to read about her habit and how the British medical service handled it. I will certainly post a link to the reviews, Kathy. I’m interested that the ending stretched the bounds of credibility for you. They did for me a little, too, though possibly for different reasons — that again, I can’t go into for fear of spoilers. Yes! Will listen this week during hot thunderstorms. Hope you enjoy it, Kathy. Icy winds here today, straight from Antarctica!